Our Tour provides a one-of-a-kind, authentic Saigon Experience! Our expert guides help you to easily navigate the busy streets of Saigon’s many neighborhoods. On our tour you’ll discover the history and culture of Ho Chi Minh City. While uncovering local areas and sights you simply won’t find without being on the Back of our Bikes! 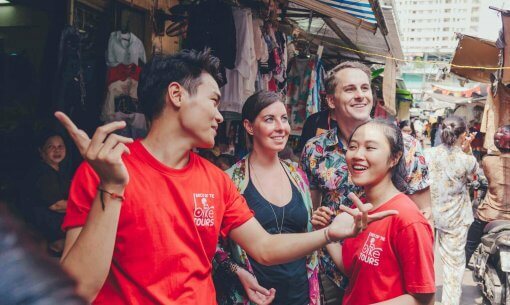 Jump on our Bikes and join our charming guides for a local’s perspective of Ho Chi Minh City. Our Tour and expert guides guarantee that you will walk away with new cultural knowledge and a happy smile! Do You Want a Fun Night Eating Delicious Vietnamese Food? Our Tour is your Once in a Lifetime, can’t miss, Anthony Bourdain Experience. You won’t want to miss this Saigon Food Tour! We designed this tour just for you! Giving you easy access to tasty Vietnamese Food during our FUN and IMMERSIVE tour. Check out of the highlights of our afternoon tour with Masterchef Winner Christine Ha. Our Excellent 5 Star Rated Tours give you VIP access to some of the best food in Vietnam while showing you the most in a short amount of time.